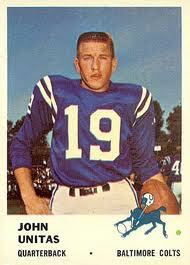 Johnny Unitas football cards are arguably the most sought after football cards in the hobby. He’s a football icon and beloved by countless football fans. Unitas was football during his era. As a result, his place in the vintage football card hobby is very comparable to that of Mickey Mantle’s in the baseball card hobby. Appearing on Topps, Philadelphia and Fleer issues over the years, there are several key Johnny Unitas cards that any serious collector should own. The Topps 1957 football set was a step forward in design for the company. Its horizontal layout with a head shot of each player on the left and an action shot on the right is instantly recognizable. Along with those of Paul Hornung and Bart Starr, the Johnny Unitas rookie card is the key to the set. The population of the card is actually quite abundant given that it was a double-printed second series card. But, you'll still have to pay up for a high grade copy. In fact, this card is one of the most valuable football cards in the hobby. It does present some condition challenges for collectors, though, with print snow and centering being the usual suspects. Unitas's second year card is a bit tougher to find in high grade than his rookie card. But, it's still not quite as valuable. And even though it's not the key to the set (the Jim Brown rookie card) holds that distinction, it's still a classic. The card features a young Unitas ready to pass surrounding by bright orange borders. Centering and print defects are among the typical challenges for this card. Right about this time, Unitas was cementing himself as the most popular player in football. Fresh off a 1958 championship victory over the New York Giants, Topps would reward Unitas by making him the #1 card in the set. This was the first of a five-year span where Topps would make Unitas the first player in their set. No other athlete in any major sport had or has ever been given that honor by a major card company. The card design is fairly straightforward, featuring a nice portrait of Unitas atop a yellow background. The small colt playing with a football in the upper right corner adds a nice touch. It was a good year for Unitas as he would put up a personal career best for most touchdowns in a single season with 32. The look on Unitas's face on his 1960 Topps card is nothing short of odd. Rather than his usual big bright smile, Unitas is staring in a weird, piercing way. Was it intentional? Or maybe just bad timing? Regardless, Topps kept the shot and it made its way onto the card. While the design is simple, it's one of Unitas's more expensive cards to find in high grade. High grade copies can set you back five figures. Unitas would break the 3,000 single season yard barrier for the first time in 1960 as he racked up 3,099 yards and a career single season best yards per game average of 258.3. The 1961 Fleer set featured players from both the NFL and AFL. Often overlooked by Unitas collectors, it's the only Fleer card he would appear on during his playing days. The card features a great color image of Unitas on what looks like the practice field based on the background. The lower right corner features another great cartoon image of a Colt playing with a football. This time the horse is losing its helmet which adds a nice touch of humor to the card. 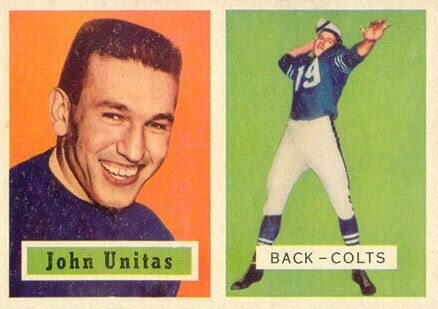 The 1961 Topps Johnny Unitas football card looks very similar to his 1959 Topps card. The company again went with the portrait view of Unitas atop a yellow background. The black bottom border with his name and player info along with interior black outlines give the card an overall more serious tone. Having thrown only 16 touchdowns on 420 pass attempts, his 3.8 TD% was one of the lowest of his career that year. Topps went back to the horizontal layout in 1962. They also brought in thick black exterior and interior bordering to make the sectional design stand out even more. But, as with any black border card, collectors are presented with the usual chipping and wear challenges. What's not to love about this card, though? You've got two great action shots of the football legend and a nice yellow bottom left corner with his player info that really make this card pop. It's definitely a favorite among football card collectors. You'll either love or hate the design on Unitas's 1963 Topps card. The yellow borders really help to make Unitas jump out but some collectors think it's a bit much. The yellow on red bordering is a bit unusual, too. Nonetheless, it's a great football card. Unitas put up a career single season best of 3,481 yards in 1963. The Philadelphia Chewing Gum Corp. issued four popular and attractive football sets featuring NFL players from 1964 through 1967, with Topps focusing on the upstart AFL during the mid '60s. All four Philly issues contain the Baltimore Colts superstar quarterback, and the 1964 Philly issue of Unitas is actually one of his easier cards to find in high grade. The 1965 Philly issue gets tougher with much fewer high grade examples in existence than the year before. Unitas is pictured dropping back for a pass in a very straightforward card design. Centering is a common challenge with this card. The 1966 Philadelphia Unitas card is no walk in the park either. Centering is quite a challenge with this one as well. The design features a much brighter color scheme than the year before which gives this issue very strong eye appeal. Poor production standards and the use of colored borders on the reverse make this card quite the challenge to find in mint condition. There are also quite a few rough cuts. Like the year before, production standards make the 1967 Philadelphia Unitas card a bit difficult to find in high grade as well. Those yellow borders make the card pop but they unfortunately show chipping and wear quite easily. It's the first time that we see Unitas wearing a helmet which makes the card a bit more unique in that regard. In 1968, and for the first time in five years, Topps released an issue that would include both NFL and AFL players. Unitas was back! His final two regular issues of the 1960s feature classic snapshots of the Baltimore Colts quarterback, and are much easier to find in high grade than his previous two Philly issues. Johnny Unitas was also included in several Topps inserts and subsets from 1968 through 1971: posters, four in ones, game cards, supers, and the extremely popular super glossy inserts give collectors plenty of opportunities to add to their collections. These inserts and subsets are much tougher to find in high grade compared to his regular issues, and considering how tough they are in the highest grades, relatively undervalued in the current market. The 1969 Topps design was quite unique with its rich orange borders along the top, left and right sides. Those borders show wear and chipping quite easily but they do give the card a very vibrant feel overall. The 1970 through 1974 Topps sets featuring the final run of Unitas regular issues are relatively scarce in the highest grades. The color scheme on this card is unique but I've never really thought it made for one of his better-looking issues. Added to that is the fact he's looking downward. It's still a great card, just not one of my favorites. Topps would for the sixth and last time have Unitas as the #1 card in their football set in 1971. The colored borders add to the condition-sensitive nature of his 1971 issue, with only two copies graded PSA MINT 9 to date. The Terry Bradshaw rookie is the key to the set but Unitas' card is also one of the most sought after. This would be the final year Unitas was featured as a member of the Baltimore Colts. Topps went with a horizontal design in 1972 that is quite popular among collectors. The big block team letters along the left side give a nice balanced look and feel to the card. The future Hall of Famer was traded to the San Diego Chargers in January 1973, where he played the final season of his illustrious career. His final two regular issues in 1973 and 1974 feature Unitas as quarterback of the Chargers. Despite the fact lightning bolts didn't seem quite right on his uniform, both of his final regular issues are very tough to find in high grade as Topps production efforts reached an all-time low. On his final Topps football card, a clearly aging Unitas is shown dropping back for a pass flanked by two field goal posts. It's a creative design overall and the bright coloration gives the card strong eye appeal. Top condition cards can go for big bucks as they're difficult to find without print marks and with good centering. There is perhaps no professional football player who is as credited with the elevation of the NFL to one of America's favorite leagues than Johnny Unitas. Unitas was a prolific passer and one of the most dominant players of his era. He goes down in history as a football legend and one of the greatest quarterbacks to ever play the game. He was inducted to the Hall of Fame in 1979 after playing 18 impressive seasons as a professional football player. His greatness on the field and popularity off the field make him one of the most iconic football players of all time. And that, too, adds to the popularity of his football cards as well.